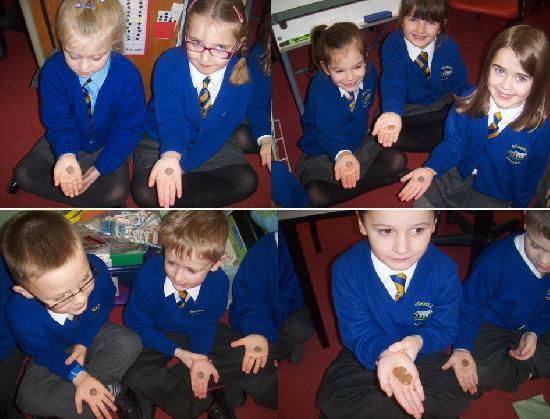 Year 2 thought they were in for a treat when Mrs Benbow gave them each a chocolate button in their hand! However they couldn't eat them, as it was part of an experiment to see whose button melted first. We discovered that Sam had the hottest hand as he was left with a sticky chocolatey mess, but Zac's hardly melted at all! Where do you read yours? How exciting the first chick has hatched! We enjoyed making all the jigsaws, 71 altogether! Should Max Cross the Road? Traction Man Saves the Day! Should Thomas Farriner go to prison? It's Good to be Me!!! Do taller people have a bigger hand span? Who lived in Bookwell in 1891? World Book Day Guess Who?